Edison Chiloquin, a member of the Klamath Tribes, fought the bank and the U.S. Government . . . and won! In short, having gotten the benefit of the bargain from the treaties with Indian nations, the federal government no longer wished to uphold, even in the smallest degree, its side of the bargain. All federal services to the tribe were canceled in 1961, and the tribe lost a million acres of pine forest and their claim to the Klamath River headwaters. 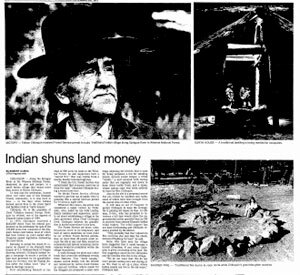 In January 1980, President Jimmy Carter signed the Chiloquin Act, which gave Edison Chiloquin and his descendants title to 580 acres for what is known as Pla-ik-ni Village. The boundaries for the village were finalized on April 8, 1985. I think that my Great Grandfather did the right thing by refusing to take the governments money in return for the land. (that was the Indian peoples land already) I am very proud to have Edison Chiloquin as my Great Grandfather, and a person I can look up to. A very moving story. I met Edison at his sacred fire in 1980. I have always drawn inspiration from his strength and spirit. A pencil drawing I did in 1979 of him remains hanging over my mantle in Portland.